If you were to take a look at all my shoes you would notice one very obvious thing, I don't own many black shoes. For some reason I am always drawn to the tan or brown variety so I made a conscious decision to find a black pair of booties. I have been looking since late summer and I finally found a pair I love and they are very affordable! 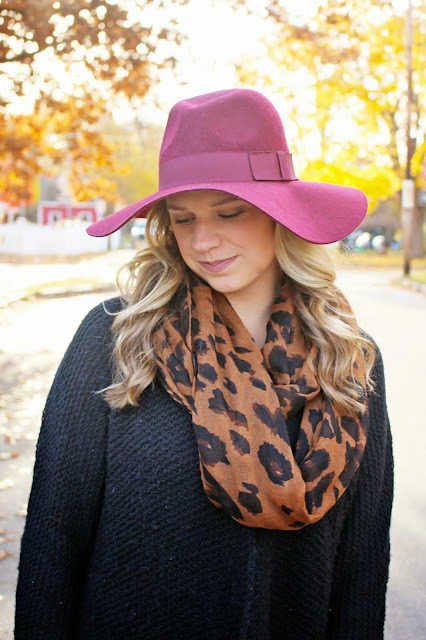 I decided to pair them with an all black look and accent it with my favorite fall combination, leopard and burgundy. You can find me in this Free People sweater on a weekly basis in the cooler months, it's an oldie but goodie and because of that I linked up a few similar ones below! More black sweater options, click below to shop!